Here are just a few testimonials from clients I've had the pleasure of working with. The service and personal attention we received from Tara Priest was exceptional. We don't know any other realtor that would have shown up on his/her own time to plant flowers to help with curb appeal! She is truly a high-caliber professional and her knowledge of the local market and negotiating skills were key in ensuring that we received the best offer for our home. In fact, she brought in 3 offers! Regardless of whether you are buying or selling, we would highly recommend Tara. We could not have asked for a better Realtor to facilitate the process of selling our home. - Mandy M.
My family and I have been enjoying our new home for the past 7 months. Prior to moving, my husband and I spent a few months working with another Agent, who was very nice, but something was always missing from the houses we viewed (e..g, pricing, yard, square footage, etc). I decided to do a google search for an Agent with experience in the Kennesaw, Acworth, and Marietta areas (within great school districts) and Tara's name appeared pretty high up in the search results. I called Tara that evening after 7pm and she was eating dinner with her family. Literally, within 1 day, Tara obtained my requirements, price range, and sent me a few options. The very first home we went to see (on the market for less than 8 hours) blew us away. We made the offer that day and were under contract the next day. We struck gold with Tara and I would recommend her to anyone, anywhere. She is customer focused, results oriented, and she gets the job done. Even 7 months later, Tara can be found dropping gifts off at my doorstep for holidays. Tara is a stellar professional! Thanks again Tara and RE/MAX. - Danielle W.
As first time home buyers, my husband and I were very excited, and quickly overwhelmed by the prospect of buying our very first home. Not only were we looking for our potential new home, but we were relocating to the Atlanta area from Tampa, FL for work. 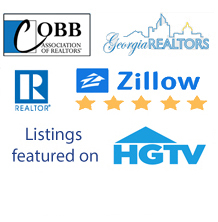 After spending days researching possible real estate agencies in the Atlanta area, we contacted Remax in West Cobb and Tara immediately called us back. She provided us with so much insight into the home buying process, and simplified an incredibly complicated process for us. Even before we were supposed to drive up from Tampa to meet with her to go look at potential homes, she made sure we were well informed and put us in contact with all the right people to make sure we would be able to find our dream home in our dream neighborhood without hitting any major snags. Upon finding our dream home online and putting an offer in, while still in Tampa, we hadn't even had the chance to go see it, Tara offered to get us as much info on the home as possible and offered to go take additional photos of the home. When we finally were able to go see the house, she met with us at the house and stayed with us throughout the walk through and the inspection of the home. About a month later, we closed on our home and we truly couldn't have gotten through that without her! She took amazing care of us long before we were able to actually meet with her face to face, and after working with her, you realize you're far more than just her client, she takes care of you like family. - Michelle D.
that you have provided all the while building a personal relationship that made us feel so very much at home during our transition to Georgia. Our new retirement home is our 16th (and hopefully last) home that we will reside in. Thanks to you and your prep work, our selection process was much easier and did not take long before we found "just the one". Your counseling and advice was so very valuable. solidified our feeling that we sure did select the right person to handle our real-estate needs. We are looking forward to having our friendship grow and wish you and your family all of the best in the years to come.